Junior tennis champion, Grace Eland from Carlisle has received £1,256 from the Cumbria Young People’s Fund to help towards the costs of training and attending competitions. 15 year old Grace competes in junior tennis championships all over the country. She also completes part of her weekly training programme at the Northumberland High Performance Centre in Newcastle, meaning accommodation and travel expenses soon mount up. Grace’s achievements to date include claiming the regional U16, U18 and open women singles titles. Last year she became the first female junior from Cumbria to win the national title, when she claimed the national doubles title with her partner from Cheshire. More recently, Grace won her first ladies’ title of the season at the Women’s Open in St Andrews. 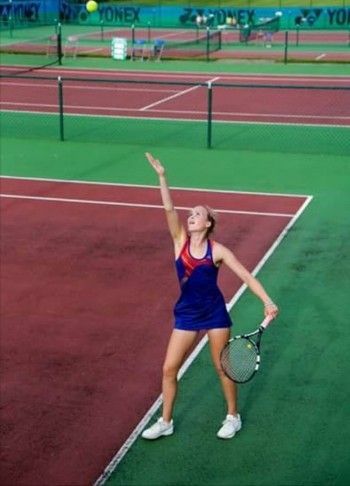 She then competed in the National AEGON U18 Team Tennis competition, playing for Bolton HPC, where the team made it through to the final at the National Tennis Centre in London. Since then, Grace has competed in the ELO tournament in Scotland and won the women’s open singles, doubles and U18 singles. Grace has qualified for both the U16 and U18 Nike National Tour Finals which take place this summer in Nottingham.